Tiananmen Square and Sun Yat Sen.
Tiananmen Square is a large city square in the center of Beijing, China, named after the Tiananmen Gate (Gate of Heavenly Peace) located to its North, separating it from the Forbidden City. 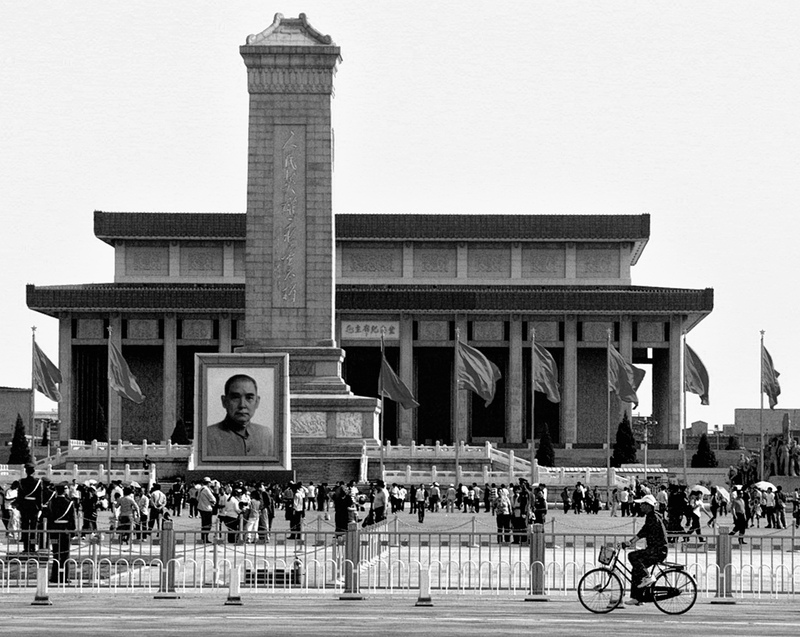 Tiananmen Square is the third largest city square in the world (440,000 m² – 880m by 500m or 109 acres – 960 by 550 yd). It has great cultural significance as it was the site of several important events in Chinese history. Outside China, the square is best known in recent memory as the focal point of the Tiananmen Square protests of 1989, a pro-democracy movement which ended on 4 June 1989 with the declaration of martial law in Beijing by the government and the death of several hundred civilians. This picture shows a portrait of Sun Yat Sen. Sun Yat-sen (12 November 1866 – 12 March 1925) was a Chinese revolutionary and first president and founding father of the Republic of China (“Nationalist China”). As the foremost pioneer of Republic of China, Sun is referred to as the “Father of the Nation” in the Republic of China (ROC), and the “forerunner of democratic revolution” in the People’s Republic of China. Sun played an instrumental role in the overthrow of the Qing dynasty during the Xinhai Revolution. Sun was the first provisional president when the Republic of China was founded in 1912 and later co-founded the Kuomintang (KMT), serving as its first leader. Sun was a uniting figure in post-Imperial China, and remains unique among 20th-century Chinese politicians for being widely revered amongst the people from both sides of the Taiwan Strait. Although Sun is considered one of the greatest leaders of modern China, his political life was one of constant struggle and frequent exile. After the success of the revolution, he quickly fell out of power in the newly founded Republic of China, and led successive revolutionary governments as a challenge to the warlords who controlled much of the nation. Sun did not live to see his party consolidate its power over the country during the Northern Expedition. His party, which formed a fragile alliance with the Communists, split into two factions after his death. Sun’s chief legacy resides in his developing of the political philosophy known as the Three Principles of the People: nationalism, democracy, and the people’s livelihood. very well-composed photograph. well done! I am so enjoying reading your blog and, although I’m sure you already have one of these, I’ve nominated you for The Versatile Blogger Award. Please see my post ‘Thank You! The Versatile Blogger Award’ for more details.